•THE MOST PROMPT OF SERVICES. 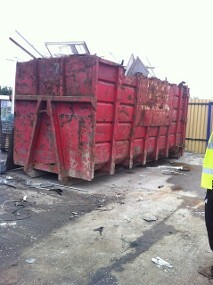 •THE COMPLETE FULL RANGE OF LOGISTIC SERVICES, FROM SOMALL BINS, UP TO 40 YARD ROLL ON ROLL OFFS. •THE VERY POPULAR MAN & A VAN COLLECTION SERVICE. •THE VERY SKILLED DISMANTLEMENT TEAM OF ALL MACHINES ETC. •THE MOST EXPERIENCED OF ON SITE VALUERS. •THE MOST FRIENDLY AND PROMPT STAFF AT OUR YARD. London’s fairest buyers of scrap metal.